AIA Document B252™–2007 establishes duties and responsibilities where the architect provides both architectural interior design services and design services for furniture, furnishings and equipment (FF&E). The scope of services in AIA Document B252–2007 is substantially similar to the services described in AIA Document B152™–2007. 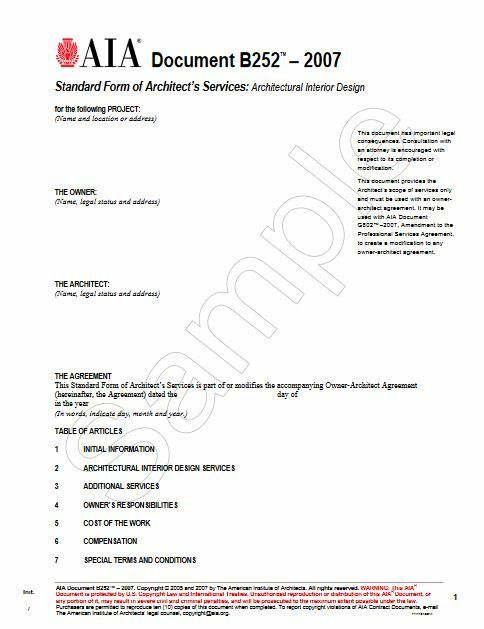 Unlike AIA Document B152™–2007, AIA Document B252–2007 is a scope of services document only and may not be used as a stand-alone owner/architect agreement. 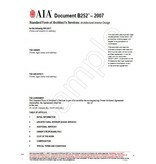 B252–2007 may be used in two ways: (1) incorporated into the owner/architect agreement as the architect’s sole scope of services or in conjunction with other scope of services Document, or (2) attached to AIA Document G802™–2007, Amendment to the Professional Services Agreement, to create a modification to an existing owner/architect agreement. B252 was revised in 2007 to align, as applicable, with AIA Document B101™–2007.